Most people have heard the term “pecking order,” but I think for a lot of them, it’s kind of abstract. They know what it means, but it’s removed from its original context. As a chicken owner, I got over this quickly. There is real pecking involved, and many times, it’s not pretty. At all. My crash course in pecking orders came right after Boss Chicken became ill and lost her ability to walk well. As soon as it was clear she was no longer the actual boss chicken, Suzy Creamcheese, the new alpha hen, pecked her bloody within seconds. I now have to stand guard over Boss Chicken when everyone’s out in the yard, to make sure the others don’t take the opportunity to remind her of her place in the flock. In most cases, the chicken being shown her place is able to run away or otherwise defend herself. Boss Chicken doesn’t have the mobility of a regular chicken, and so she can’t do either of those things. She got pretty busted up after Suzy Creamcheese had at her, and while she was generally o.k., I learned that the pecking order was not something to be taken lightly. It seems that the order is not set in stone, either. When I introduced the new chicks to the flock, my assumption was that they would be at the bottom of the hierarchy. I was pretty much right, I think. It was hard to tell, because once everyone was accustomed to each other, the n00bs did their best to avoid the old guard as much as possible, even in the run. There was a lot of hiding in the corners, or running from one side of the coop to another to just steer clear of their elders. However, now that they’re a little older, and everyone is allowed out into the yard again, it seems that there is a lot of jockeying for status going on. It used to be that the n00bs would keep to themselves, away from the others, though they would still bump chests and do a little bit of negotiating within their own small group, but allow that the grown ups were in charge. This spring has brought about some changes. I’m not sure if it’s that the n00bs are bigger, or if everyone is just feeling tougher for having made it through the winter, but it’s getting rough out there. The first day of free ranging this year saw Steve (I think, it might have been John) going after one of the Mandrell Sisters pretty aggressively. By “aggressively,” I mean “biting her comb viciously not once, but twice.” She got away after the first bite, but Steve (or John) wanted to send a message. Then last weekend, as if to just be clear on who was totally in charge, Henny Penny went after Steve (or John, but let’s just assume it’s all Steve) so badly that I decided to intervene. She was pecking Steve’s head really hard, and Steve was just squatting down and taking it, like it was some sort of fraternity pledging ritual. After the first couple of pecks, we get it, Henny Penny. Luckily, there wasn’t any blood, but there certainly seems to be blood lust in the flock. Or social climbing. Or maybe everyone has just had it with each other after being kept in close quarters for so long. 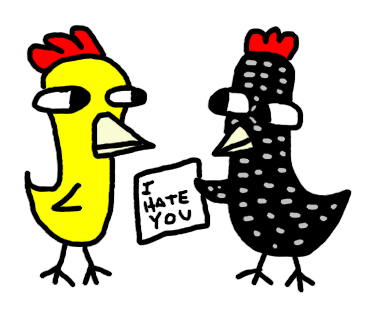 No passing notes in chicken class, even if you’re sick of each other. I realize the ways of chickens are different from humans. We shouldn’t judge based on our own societal standards, but sometimes that’s what happens. The pecking order can be very not fun to witness (especially the pecking part – I’m ok with order), but generally it’s a subtle thing. But sometimes it’s not. If I think one of my chickens is in danger of serious injury, I’ll step in, like I did with Steve and Henny Penny. That looked like it wasn’t going to get better on its own, and the point had been made. Safety first, always. I already knew that a lot of common phrases have pretty grisly origins, and there are probably ones much more grisly than chickens pecking each other. 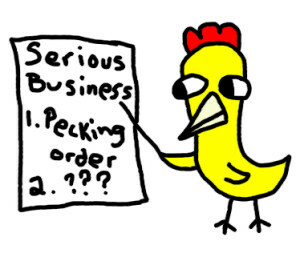 At the same time, I’ve found that I don’t use “pecking order” outside of a chicken context anymore. 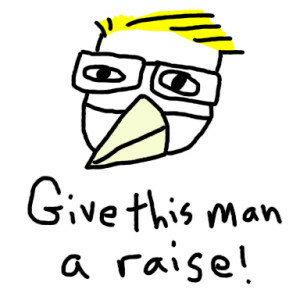 However, if I need to move up the ladder at work, I’m not above putting on a giant beak and attacking whoever it is in the position I’m gunning for. This will make self-evaluation time much more interesting this year. 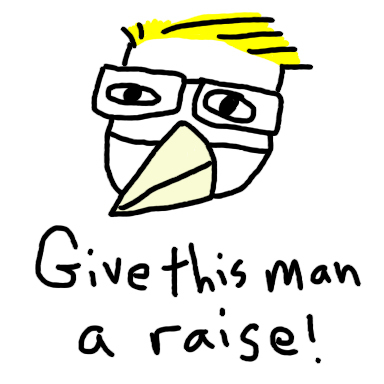 No blood on the beak means I haven’t asserted myself enough. This entry was posted on Friday, April 24th, 2015 at 2:03 pm	and is filed under Backyard chickens, Chickens, Pecking Order. You can follow any responses to this entry through the RSS 2.0 feed. You can leave a response, or trackback from your own site.